Rich butters that actually absorb moisture and keep you hydrated! Great for FACE + BODY! I wanted a thick body butter that would nourish but not clog pores. I wanted it to be protective for harsh weather, but breathable and able to be applied lightly for smooth skin. You can use this on your face + hands + feet + wherever! Cupuacu + Mango + Shea butters leave your skin the silkiest it has ever been. Prickly Pear + Argan Oil support moisture and softening, making this great for dry or mature skin. This has quickly become my go-to for my face. I use this as my last step, mixed with a drop of UMBER ROSE and SUN HAT. Essentially this butter is deeply hydrating and seals in mousture (great on wet skin) while also being safe for sensitive skin and face. This butter is so epic I don't know where to start. I mix a few drops of serum in and use a tiny bit on my face. I slather it on my legs + arms + hands + nails + and then run the excess through my hair. 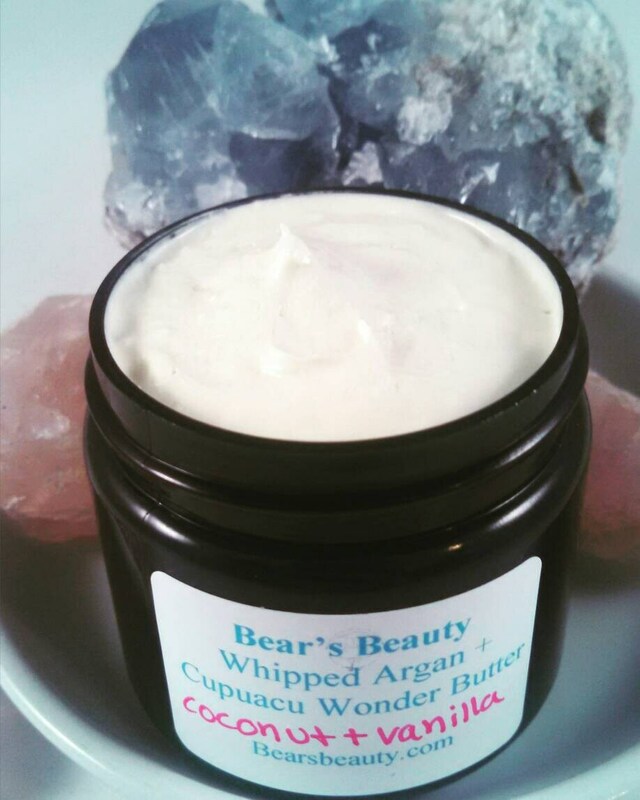 Cupuacu Butter is silky + smooth + doesn’t clog pores + reduces signs of aging + holds water + plumps skin + hydrates + soothes. Cupuacu has quickly become one of my favorite butters to work with. It smells lovely and feels silky, but that is just the start. Cupuacu is one of the few oils in nature, other than coconut, that contains Lauric Acid. Lauric Acid is antibacterial and antiviral, making it an ideal butter for skin issues. Cupuacu butter is also rich in plant sterols and antioxidants. Organic Mango Butter is rich in Vitamin A and helps reduce stretch marks and scars. Organic Argan Oil + Prickly pear are is rich in Vitamin E + super light + nourishing + reduces signs of aging. Butter may be slightly solid in cold weather and slightly soft in warm weather. I like to apply on damp or wet skin.